The Anacostia River flows from the Maryland suburbs of Washington, DC to its mouth at the Potomac River near downtown Washington. Its watershed encompasses 176 square miles and contains 13 subwatersheds in southeast Washington, DC and Montgomery and Prince George's Counties in Maryland. The watershed is composed of three main drainage areas - the Northeast Branch, the Northwest Branch, and the tidal river. The Northeast and Northwest Branches converge in Bladensburg, MD and form the tidal Anacostia River, which flows 8.4 miles through Maryland and Washington, DC until it meets the Potomac River at Hain's Point. The Anacostia Watershed is home to over 800,000 residents of Maryland and Washington, DC and includes some of the most economically distressed areas in the metropolitan region. Wetland loss, deforestation, and urbanization have significantly degraded the water quality of the Anacostia River. About 23 percent of the land area of the watershed is impervious. Urbanization is particularly dense on the east and west banks of the tidal river in Washington, DC, where more than 70 percent of the land is covered by impervious surfaces. In 1987, the District of Columbia, the State of Maryland, and the Counties of Montgomery and Prince George's jointly signed the Anacostia Watershed Restoration Agreement. This agreement officially recognized the ecological and economic importance of the river and resulted in the formation of the Anacostia Watershed Restoration Committee (AWRC). The primary goal of the AWRC is to plan and coordinate restoration projects throughout the watershed. The AWRC commissioned a comprehensive inventory of the watershed to identify necessary restoration projects. By 1990, the AWRC had identified 207 stormwater retrofit, stream restoration, wetland creation, and riparian reforestation projects. In 1998, the AWRC reported that more than 700 restoration projects had been planned and that 30 percent of them had been completed since the organization's founding. 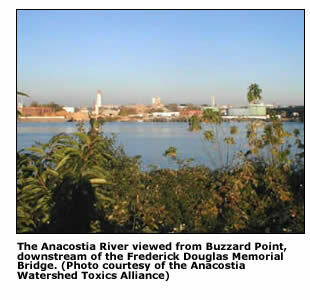 -Adapted from information provided by the Anacostia Watershed Network.